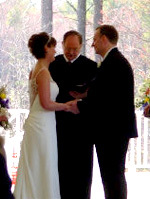 My ministry is focused on providing you with a high quality, personalized wedding. Your wedding should be meaningful and inspirational to you, lighting up the light in your eyes and reflecting your love. That’s what will make your wedding sacred – not the location or any other factor. And that’s my goal. Welcoming all, regardless of religious background or sexual orientation.